Soup is a lot like a family. Each ingredient enhance the others, each batch has own its charcteristics, and it needs time to simmer to reach full flavour. Marge Kennedy. The Ajo Blanco cold soup recipe is originally from Spanish cuisine. Garlic, white bread, and almonds are the base ingredients for this recipe. It has own characteristics and delicious flavor for which it has been popular all over the food cuisine. The Ajo Blanco is a Spanish word, that refers to the garlic and almonds. Generally, the bread is soaked 5 to 6 hours with roasted almond, garlic for softening it, then well blend together until it turns smooth paste. Finally finishing with water and olive oil are added the mixture is beaten until it has an emuldion -like texture. The Ajo Blanco cold soup recipe taste likes little sweet and little spicy as a result it gives unique taste and flavor. This dish is made of bread, crushed almonds, garlic, water, olive oil, salt and sometimes grapes and green apple. It is usually served with grapes or slices of green apple. Combine all the ingredients except olive oil in a bowl and add with a 1 cup water. Keep in the chiller for 5-6 hours for softening the bread and for which it will be more chilled. When the bread is softened, transfer this mixture to the blender and blend well. Then add the water gradually if too thick, until smooth. Remove it and keep in a bowl. then add olive oil, salt, and crushed pepper in this mixture of soup and whiskey well until the soup is emulsified. Then strain the soup through a fine strainer into a large bowl, cover and chilled very cold. 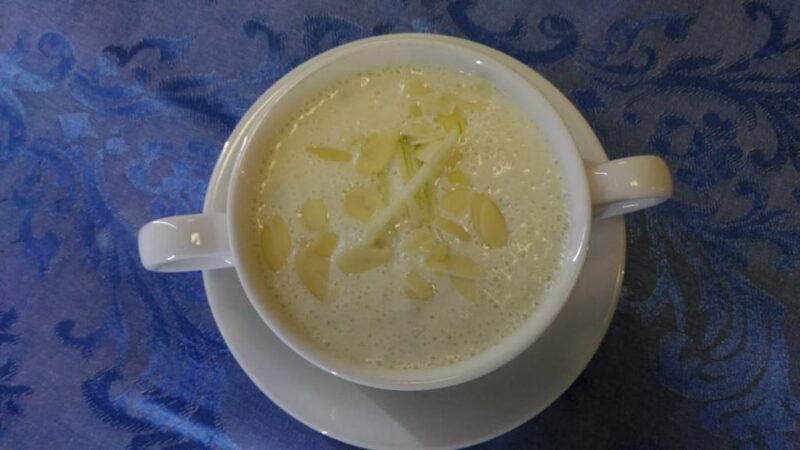 Divided into soup bowl, garnish with almond flakes and a slice of green apple and served cold.